In commemoration of the sustained philanthropy towards us with the terrible threat of the earthquake, from which despite all hope the philanthropic Lord redeemed us. Your wrath being full of compassion. The earthquake of December 14th in the year 557 was a terrible earthquake that lasted ten days. 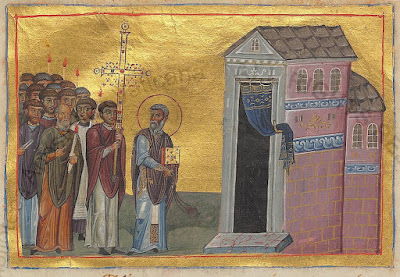 The chronicler Theophanes says that both of the walls of Constantinople suffered major damage, many churches fell together with the altars and their canopies, and whole areas were razed, which is why he writes: "There was not a place or suburb that did not fall from the terrible threat of the earthquake." The earthquake was so great and terrible "that no man of that generation on earth would forget it." Emperor Justinian I "did not put on his crown for forty days, and for the holy Nativity of Christ he entered the church without it." 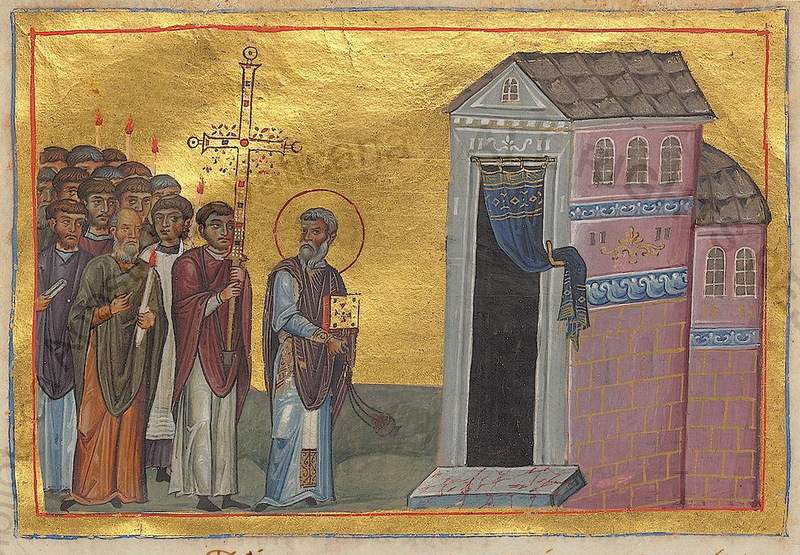 Kedrinos says that he also entered during the celebration of Theophany without a crown. It seems this was a major disaster and there were many casualties. There were two precursors to the major earthquake of 557. On 16 April 557, the first earthquake of the year had shaken the city. It caused no real damage. On 19 October 557, the second earthquake struck, with a similar lack of damage. The third and major earthquake struck in December. Agathias describes it as unparalleled in magnitude and duration. He also describes the city as affected by a severe winter prior to the earthquake. Tremors started towards midnight, when most residents of Constantinople were sleeping. The tremors awoke the citizens and as the buildings trembled, "shrieks and lamentations could be heard." The successive tremors were accompanied by thunder-like sounds from the ground. The air reportedly "grew dim with the vaporous exhalations of a smoky haze rising from an unknown source, and gleamed with a dull radiance." The panicked residents started evacuating their houses, gathering in streets and alleyways. Agathias observed that the city had precious few "wide open spaces entirely free of obstructions," which meant that residents were not safe from falling debris even outdoors. A shower of sleet soaked those outside and everyone "suffered greatly from the cold." Many sought refuge within the churches of the city. Agathias notes that disorder reigned. A great number of women, both the low-born and the noble, were in the streets. Men and women "mingled freely," an event unusual in itself. Few paid attention to rank and privilege in the rush to avoid injury. Slaves, for example, paid no attention to the orders of their masters. The district of Rhegium, close to the port of Constantinople, suffered the greatest loss of houses. Many other buildings were demolished or suffered structural damage. Agathias notes that "large numbers of ordinary people" perished, while Anatolius was the only casualty among the high-ranking in society. By dawn, the earthquake had ceased. The overjoyed people started seeking those nearest and dearest to them, "kissing and embracing and weeping with delight and surprise." The dome of the Church of Hagia Sophia was weakened in the earthquake and collapsed completely in May 558. The walls of Constantinople were severely damaged. In early 559, attacking Huns managed to pass through damaged areas of the Walls. Various other churches and buildings were damaged. Justinian I started a short period of mourning, not wearing his crown for the forty days following the earthquake. The earthquake was later commemorated by an annual liturgy of supplication. Agathias also claimed there was a short-lived effect on the attitude of the population: the wealthy were motivated to charity, doubters were motivated to pray, and the vicious were motivated to virtue, all in an apparent effort of propitiation. Agathias reports that soon enough everyone lapsed into their former attitudes.